Earth Day, this Sunday, April 22, comes at a particularly apt time for the citizens of the Wood River Valley. After six months of a snow-white landscape, mid-April is generally when we begin to see the rich brown earth again. In its 42nd year, Earth Day marks the anniversary of what many consider to be the birth of the modern environmental movement. Founded in 1970 by Gaylord Nelson, then a U.S. senator from Wisconsin, the first Earth Day saw 20 million Americans take to streets, parks and auditoriums across the country to demonstrate for a healthy, sustainable environment. For 2012, the centerpiece of Earth Day is a Mobilize the Earth rally on the National Mall in Washington, D.C. The focus of the event, put on by the Earth Day Network, is to galvanize the environmental movement. Out here in Idaho, the streets probably won't be lined with environmental crusaders. However, there are a few events scheduled that will help the citizens of the Wood River Valley feel closer to Mother Nature. For some down-and-dirty, hands-on earth hugging, grab the kids and head to the Sawtooth Botanical Garden for the annual Bug Zoo Festival, from 1-4 p.m. on Sunday, April 22. This hands-on exhibit is celebrating its 10th year of showcasing dozens of species of creepy-crawlies, with the aim of educating the public and school groups about the insect world. "The Bug Zoo Festival is always held the Sunday after Earth Day, because the mission of Earth Day is in line with our mission," said Kathryn Goldman, executive director of the garden, "which is to serve as a showcase for the native and cultivated plants that flourish here at high altitude and encourage environmental stewardship. "This year our theme is Dr. Seuss' 'The Lorax,' which has a strong tie to Earth Day, and is geared to the same age range that the bug zoo is (2-12)," she said. "It's a really fun thing for kids—it's very interactive. We'll have characters from 'The Lorax' at the zoo, plus lots of arts and crafts related to these themes and the movie/book." The book "The Lorax" was first published in 1971, amid the groundswell of the burgeoning environmental movement, and it is commonly recognized as a fable concerning the danger that corporate greed poses to nature. A movie version was released last month. But while arts and crafts are all good fun, what people really want at the bug zoo is to get their hands on some real live insects. 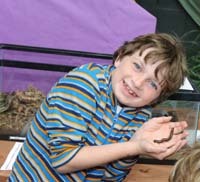 "This year we have some super-huge millipedes—they are outrageously huge!" Goldman said. "We also have some lunar moths that are really interesting looking." But the star of the show is the emperor scorpion. "Scorpions are actually spiders—a lot of people don't know that," explained Education Director Allison Marks. "This one is from the tropical forests and savannas of Africa. It likes the hot, humid environment. These scorpions can get up to 4 feet long, they can live without food for up to a year and live under water for two days." The Bug Zoo continues for two weeks following the festival, through May 5, and is open from 1:30-5 p.m. on weekdays and 10 a.m. to 4 p.m. on weekends. Admission is free. For more information visit www.sbgarden.org or call 726-9358. The garden is located off state Highway 75 at Gimlet Road. As part of the Earth Day theme, children from the local 4H chapter will be handing out conifers at the festival for people to take home and plant in their gardens. Other nods to Earth Day throughout the valley include the Hailey Community Climate Challenge plastic-bag-free day. Hailey grocery stores Atkinsons', Albertsons and King's will be banning plastic for the day and handing out free reusable grocery totes. The Nature Conservancy is hosting a Picnic for the Planet at Silver Creek Preserve, noon on Sunday. Bring lunch to the visitor center and enjoy local snacks. The picnic follows a bird walk from 10 a.m. to noon on the preserve. Call 788-7910 to register. And, if all this earth love inspires you to think harder about how you can help combat climate change, head to Hailey City Hall on Thursday, April 26, from 6-7:30 p.m. for a "Making 'Cents' of Energy Efficiency and Rebates" seminar. For details, call 788-9815, ext. 24.